Most parcels are shipped via UPS Standard Ground Service unless parcels exceed the maximum weight limit. If packages are overweight, shipping will be arranged through common carrier. Most Items (Products available for purchase on this site) are shipped within two business days and are delivered within 4-7 business days. Other levels of Service can be arranged if required. 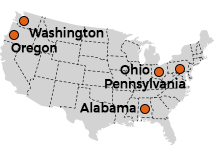 UPS ground service is available in most States and Provinces (Canada).